J. J. DEVILLE CLOISONNE ENAMEL AND YELLOW GOLD J. J. Deville, Genève, case No. 99908. Made circa 1880. 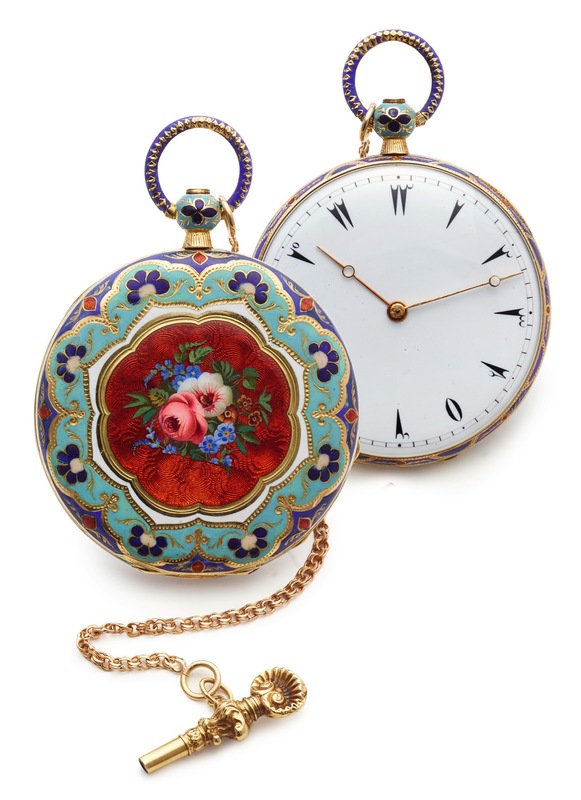 Very fine, 18K yellow gold and enamel, key-wound pocket watch. Accompanied by a 12 cm.gold chain and a key. Four-body, bassine, solid, polished, the entire case decorated in multi-color cloisonné enamel floral and leaf motif. Hinged gold cuvette engraved with the technical details, apertures for winding and setting. White enamel with painted radial black Turkish numerals, outer minute track. Yellow gold Breguet hands. 48 mm., frosted gilt, standing barrel, 8 jewels, over-hanging ruby cylinder escapement, three-arm brass balance, flat blued steel balance spring, index regulator. Cuvette signed. C. Four-body, bassine, solid, polished, the entire case decorated in multi-color cloisonné enamel floral and leaf motif. Hinged gold cuvette engraved with the technical details, apertures for winding and setting. D. White enamel with painted radial black Turkish numerals, outer minute track. Yellow gold Breguet hands. M. 48 mm., frosted gilt, standing barrel, 8 jewels, over-hanging ruby cylinder escapement, three-arm brass balance, flat blued steel balance spring, index regulator. Cuvette signed.